The Imperial Love Trophies Egg was created in 1907 for the Dowager Empress Marie Feodorovna as an Easter gift from Czar Nicholas II. 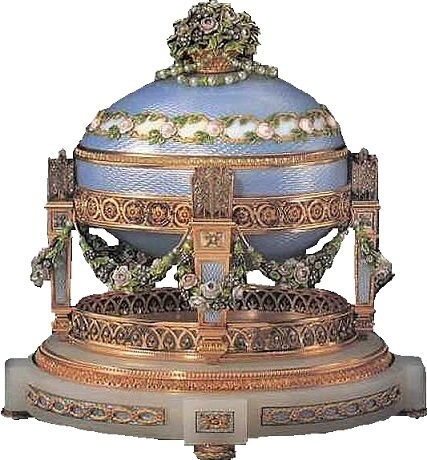 The gold egg enamelled in blue was created in the style of Louis XVI and is decorated with a band of enamelled roses and leaves and panels of opalescent oyster enamel. A pierced golden basket filled with enamelled roses set with diamonds and hung with pearl swags sits on top of the egg. Four columns support the egg, modelled as love trophies in the form of quivers containing Cupid's sets of arrows. Heavy swags of enamelled roses and leaves set with diamonds and pearls link each coloumn. The surprise which would have been inside the egg is now unfortunately lost. This cross stitch design places the rose basket in the centre, surrounded by the swags of roses and opal panels. The corners of the design reflect Cupid's arrow heads, with rich golden patterns along the edges. 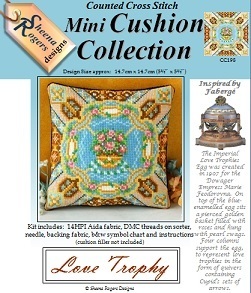 This mini cushion cross stitch kit includes: 14HPI white aida fabric, ready-sorted DMC Stranded Cotton Threads on a numbered sorter, needle, backing fabric, b&w symbol chart and instructions (cushion filler not included). Only whole cross stitch is required throughout with a few backstitches needed on the basket.